Take the stress out of your day trip out by letting us take care of it for you. Our day trips include return travel from a choice of three pickup points and entry into attractions. Have a look at our upcoming attractions below and give us a call or drop us a message to book. 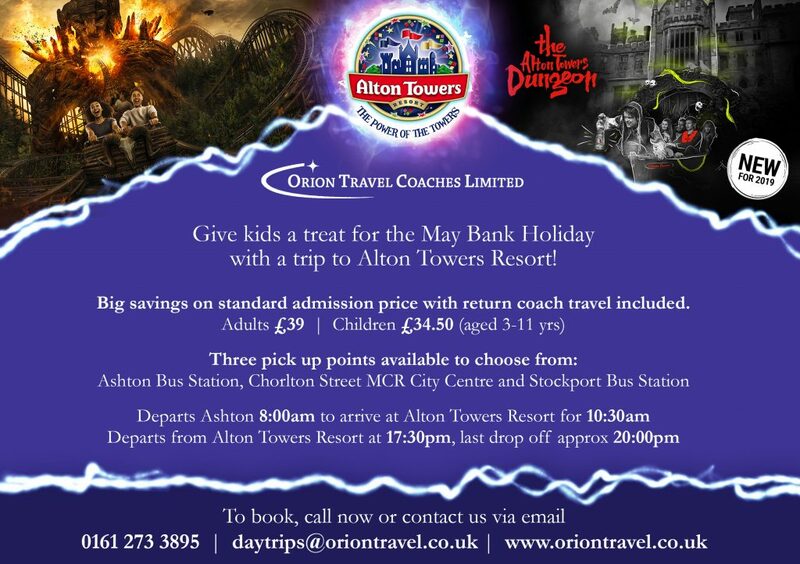 Treat the kids this Bank Holiday Monday with a trip to Alton Towers Resort. New for 2019 The Alton Towers Dungeon experience (Tickets can be bought at the park on the day). New E-Ticket system for 2019, no need to wait for tickets just get off the coach and enter the park. Loss of luggage or any personal belongings. Breakdown of the Orion Travel vehicle. • Orion Travel limits its liability resulting from the excursion to the value of the ticket price.